A series of letters issued by the Ministry of Interior on Tuesday night – one chastising two election monitors, and another offering a blanket warning to NGOs – have again raised the spectre of the Kingdom’s controversial and widely criticised Law on Associations and NGOs (LANGO). passage as giving authorities broad powers to silence criticism. The Situation Room had drawn the ire of Prime Minister Hun Sen – and a Ministry of Interior investigation – after it declined to label the Kingdom’s recently concluded commune elections fully free and fair. In a separate letter released Tuesday night, the ministry said that while a few NGOs had complied with the law’s strictures, many had not fulfilled their obligations under articles 10 and 25, namely to submit bank account details, donor funding and activity and financial reports to the relevant authorities – elements of the law fiercely contested by civil society as being excessive and restrictive. “In case any local associations and NGOs fail to comply with the conditions stated in point 1 above, the association or NGO will receive legal action according to LANGO,” the letter reads. According to the notification, NGOs will have until the end of September to submit all their local bank accounts, and will have to produce annual and financial reports to the Ministry of Interior and Ministry of Economy and Finance for 2016. Chhim Kan, director of the ministry’s Department of Associations and Political Parties, said only around 100 NGOs had met the law’s requirements and the letter was a reminder to other groups to comply as well. He would not comment on the timing of the letter, only to say the law’s implementation began this year. “They need to submit by the deadline. [Last year] we did not restrict them; we did not notify them because we wanted to wait and see their implementation,” he said. However, NGOs yesterday said they had yet to receive clarification from the ministry on how to fulfil what they characterise as the law’s cumbersome requirements, with the letter prompting many of them to organise meetings to discuss their next course of action. Equitable Cambodia’s Eang Vuthy said the letter came as a surprise, and that there was still no clarity on how his organisation should present the information required by the Interior Ministry. he said it was not hard to see a trend, given the recent investigation into the Situation Room. 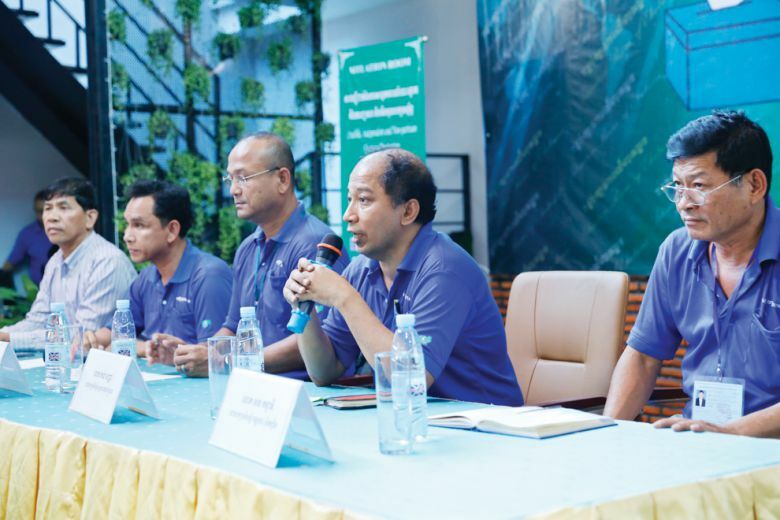 Chak Sopheap, executive director of Cambodian Center for Human Rights, said the government was pushing NGOs on the very articles they had raised objections to as being burdensome, intrusive and unjustified, casting an air of suspicion over the ministry’s intentions. “We are concerned that these provisions are now being applied apparently in reaction to the legitimate election monitoring activities of civil society,” she said. With regards to the Situation Room, Sotheara Yoeung, monitoring and legal officer for Comfrel, said that certain flawed elements of the electoral process were hard to ignore, especially the tense electoral environment in the run-up to the June 4 ballot, and asking for improvements did not constitute political bias. “We are not pro-opposition. Whatever the political environment was, the public can judge that. [Even with] the amendments to the Law on Political Parties and threats of civil war,” he said, referring to allusions to conflict by Prime Minister Hun Sen, and legal changes that would have allowed the ruling CPP to dissolve the opposition. Human Rights Watch’s Phil Robertson said given the broad sweep of the government’s requests, which he called a “fishing expedition”, it was advisable for NGOs to group together and demand an explanation from the government. “The political abuse of this law shows just how far PM Hun Sen is prepared to violate human rights to preserve his power,” he said in an email. This entry was posted in Human Rights, NGO, NGO Law, Phnom Penh, Phnom Penh Post and tagged Cambodia, Human Rights, NGO Law, NGOs, Phnom Penh, Phnom Penh Post. Bookmark the permalink.